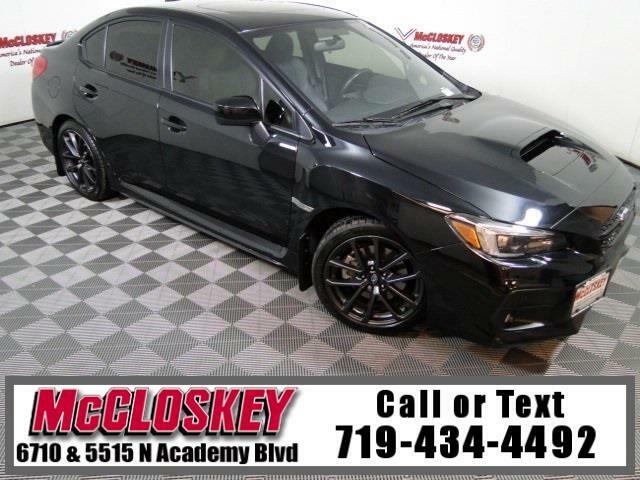 Conquer Colorado in this 2018 Subaru WRX Limited All Wheel Drive with Power Moon Roof, Keyless Entry, AUX and USB Connection, Heated Leather Seats, and Backup Camera! The Limited builds on that with LED headlights and foglights, automatic high beams, a 10-way power-adjustable driver seat, leather-trimmed upholstery, keyless ignition and entry, and an optional continuously variable automatic transmission (CVT) with paddle shifters.A 6-foot-tall rear passenger can sit behind a 6-foot driver. The driver's seat offers more adjustment, and therefore room, than expected of a compact car. The low dash and hood create an expansive view of the road. This vehicle passed our 110 multi-point inspection and is backed by our National Quality Dealer of the Year Award. We are an ''A+'' Better Business Bureau Rated Business. We offer low interest rate financing, low down payments and the highest trade allowances in the state! Here at McCloskey we do things a bit differently, we shop our competition every day to ensure a great value to you. Come on down and experience it for yourself. This McCloskey Assured vehicle includes a 2 month/2000 mile Warranty and a Vehicle History Report!! At McCloskey we strive to provide ASSURANCE, TRUST, VALUE AND QUALITY! Call 719-434-4492. Message: Thought you might be interested in this 2018 Subaru WRX.